Head to any good liquor store, and you're likely to see a number of Italian-named bottles you may have never heard of. Today, we will demystify one of them for you. Meet Punt e Mes (pronounced poont-eh-mess). The name translates to "point and a half" and, so the story goes, it's one part vermouth and half a part intensely herbal-bitter quina liqueur. Regardless of whether that's accurate, it describes the flavor nicely: It's got the body and the rich sweetness of a classic sweet vermouth but a more substantial bitter, herbal backbone. You can swap it for vermouth in many drinks, but its fun bitter elements add a distinctive flavor to any cocktail. Give these three simple drinks a try and see if we can't convince you to keep a bottle on hand this spring. Pour Punt e Mes over ice and add an orange twist, and it's delicious on its own. But for those still getting used to the bittersweet flavor, some soda water will lighten it up. Low-proof and easy-drinking, it's a perfect afternoon sipper. 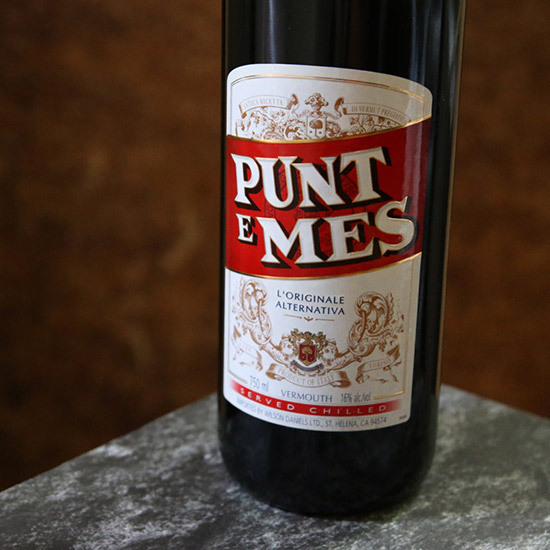 Instructions: Add 2 ounces of Punt e Mes to a tall glass with ice. Top with 4 ounces of club soda. Garnish with a lemon slice. For this riff on a Rob Roy—essentially a Scotch Manhattan—we're swapping out sweet vermouth for Punt e Mes, adding its characteristic herbal-bitter kick. Simple and classy, it's an impressive post-dinner option. Instructions: In a mixing glass with ice, combine 2 ounces Scotch, 1 ounce Punt e Mes and 1 dash Angostura bitters. Stir all that together until well-chilled. Strain into a cocktail glass without ice. Garnish with a big twist each of lemon peel—twisting over the surface of the drink to spray its citrus oils all over. Tequila may seem an unlikely match here. But we love the herbal-bitter Punt e Mes with silver tequila's grassy, vegetal flavors. It's like a margarita that's an awful lot more sophisticated—a great choice all summer long. Instructions: In a cocktail shaker with ice, combine 1 1/2 ounces silver tequila, 3/4 ounce Punt e Mes, 3/4 ounce freshly squeezed lime juice and 1/2 ounce agave syrup (equal parts agave cut with hot water). Add a dash of orange bitters. Shake that all up and strain into a rocks glass with fresh ice. Garnish with an orange slice or several.